5 Bedroom Semi Detached House For Sale in Gwynedd for £435,000. 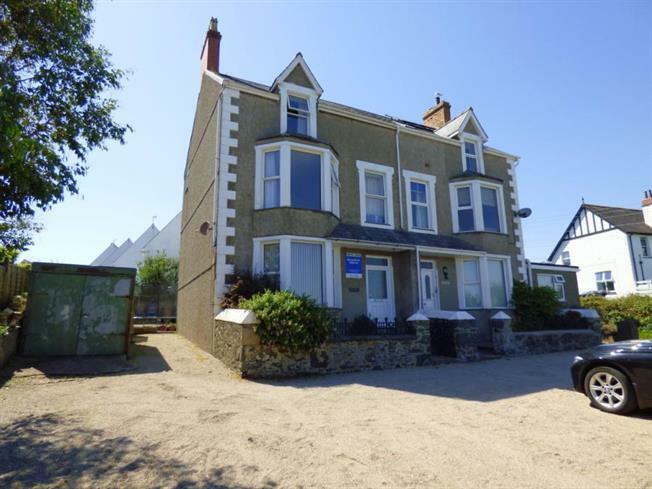 A substantial three storey 5/6 bedroom semi detached residence with good vehicular parking in Abersoch Village with delightful views from the upper two floors towards Cardigan Bay, Llanbedrog headland and the Welsh mountain range in the background. The property has the benefit of double glazing and oil fired central heating. The ground floor provides a front sitting room with opening into fitted kitchen/breakfast area, a rear dining room and utility room. On the first and second floors there are five to six bedrooms with five of the bedrooms of generous proportions, a bathroom also on the first floor. There is parking space for four to five vehicles at the front, with a rear patio area. THIS IS AN IDEAL RESIDENCE FOR A LARGE FAMILY WITH BUSINESS OPPORTUNITIES FOR USE AS A BED AND BREAKFAST ESTABLISHMENT, SUBJECT TO NECESSARY PLANNING CONSENT. Bron Aber lies in a convenient slightly elevated in Abersoch Village, with an excellent variety of shops, restaurants and cafes and close to the main beach, inner and outer harbours, Yacht Club and golf course. comprehensively fitted with a built in ceramic 4 ring electric hob and oven beneath, under space with plumbing for dish washer. L-shaped peninsular unit. oil fired central heating boiler, plumbing for washing machine. large double glazed deep bay window enjoying wonderful views over Abersoch with Cardigan Bay, St Tudwals (East Island) and views of Llanbedrog headland and Snowdonia in the distance, pedestal wash hand basin. wash hand basin, tiled splashback, fitted wall mirror.